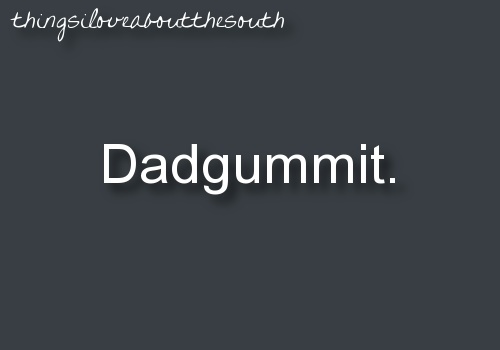 Dadgummit… another sweet southern way of changing a curse word to something nicer that the original word. I’ve mentioned here and here how southerners like to change curse words into NON-curse words, but still give them the ability to express frustration. This is another example, dadgummit has the same intention as saying dammit. Which I was never allowed to say growing up. I’d like to say that I still had a sweet mouth and didn’t curse, but my friends won’t let me lie to y’all. 🙂 Suggestions of other words that are substitutes for curse words in the south?